I saw these runners in the Grandinroad.com catalog this morning. I knew I could use them for many party themes, including my Easter table, and the upcoming Woodland Baby Shower I am helping one of my BFFs to plan for January. I bought BROWN woven tablecloths for the two tables of twelve we want to seat for a luncheon at her house. These runners will add that extra 'pop' to the tablescape. 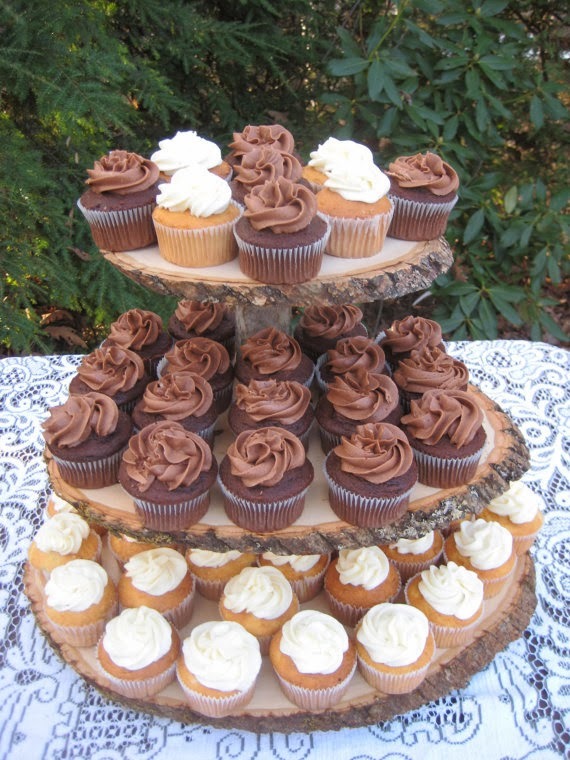 I ordered two rustic wooden boxes (24" long by 5" wide by 4" tall for centerpieces. 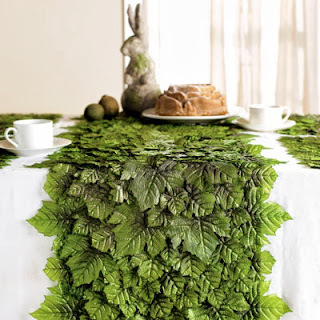 I am going to recycle the silk greenery I used for my Christmas centerpiece that I built from a PIN. See photo here. 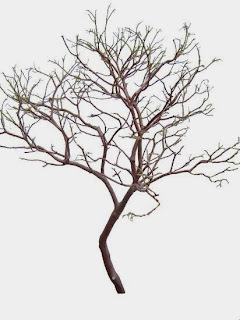 I ordered manzanita branches from Amazon.com for tabletop trees. I can put these into the styrofoam in the boxes, add the greenery below them. They came today and are just beautiful. I went "exchange" shopping with my friends today. I told myself I wasn't going to buy anything. But... if you see what's on my dining room table in the photo below, you will know that I didn't listen to myself. 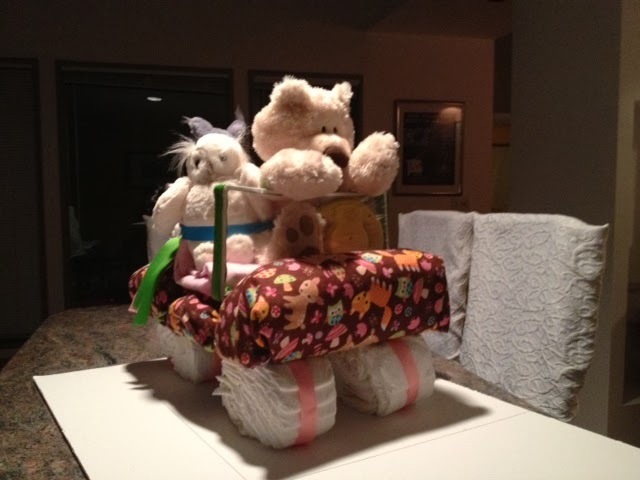 Here is the diaper jeep almost finished. 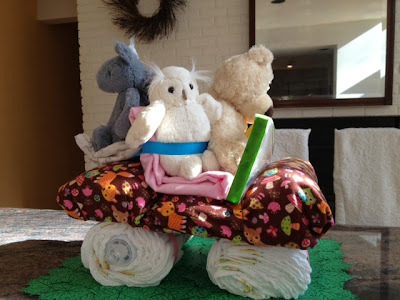 Do you see how the front wheels are collapsing under the weight of all the diapers? Not to worry...I am putting baby bottles in the middle of each one as axles. It's working like a charm. I also added green leaves I printed out on green printer paper. I layered them for dimension. I found the owl jacket at T.J. Max for $5. Honest. It is a baby size 6 months. I HAD to buy that. I sent the photo to my BFF. She replied, "What a hoot." She really did. 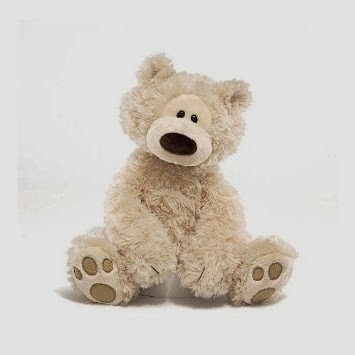 See the tiny resin bears. They are about 8" long. They will cling to the wooden centerpiece boxes. I got those at Plow and Hearth. 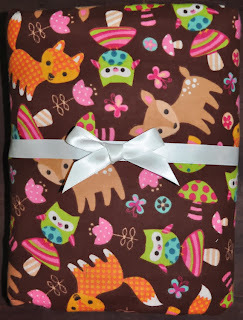 The material under the owl's head will be a baby blanket that will become the box on the back of the jeep. The ribbons will tie the diaper wheels together to hide the rubber bands. 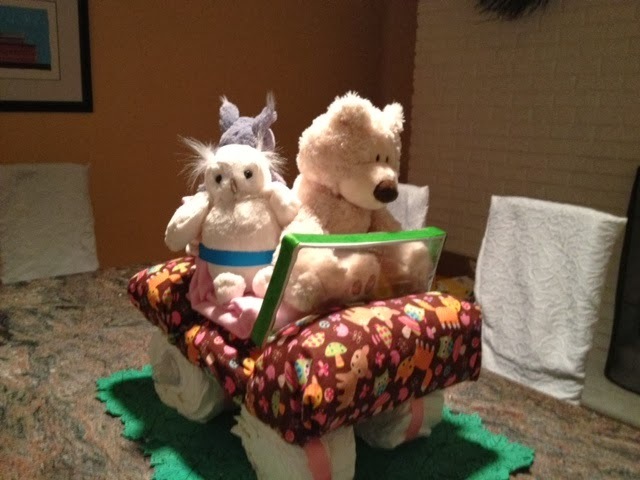 Under the bears are more receiving blankets that will be the jeep's seats--for the bear and owl to sit on. 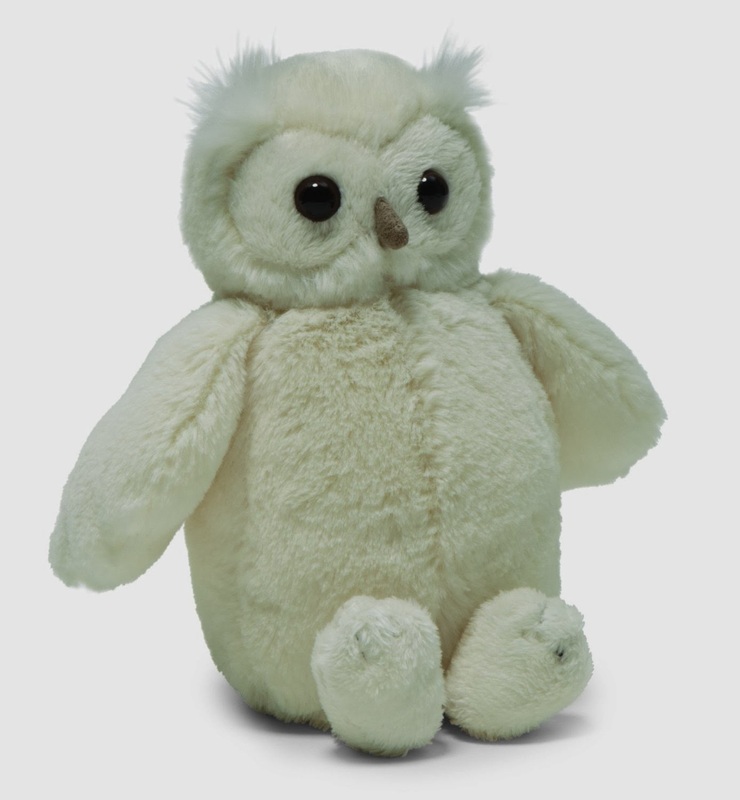 When I found the ceramic microwaveable, steaming bowls with OWLS on them, I HAD to buy those for prizes for one of the games. Okay...I'll tell you now. We will have the guests draw a nursery, on paper, on top of their heads. The candy bars are the pregnancy terms matched to candy game. Go on Pinterest and search "Baby Shower Candy Game." I have never owned brown tablecloths before. I'm pretty sure I can use them in lots of ways. I am reusing my woven chargers for under white plates with white napkins. My friend has a tall buffet next to the table. I am making a diaper jeep, similar to the one I made for the Safari baby shower. A bear, owl, squirrel, etc from Jelly Cats brand (they are soooo soft) will sit in the jeep. I will not put my deer away from the holiday. I will bring them along for decorations. Below is the receiving blanket I am folding up to make the body of the jeep. I make diaper wheels in cake pans, then take them out and put rubber bands around them topped with ribbon. I use a piece of foam core for the jeep's body. 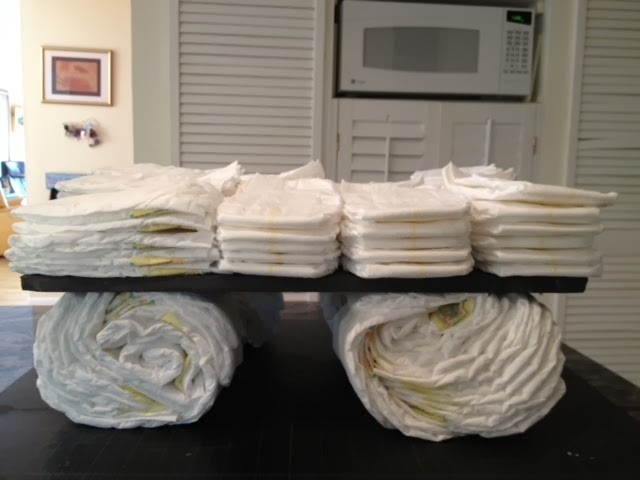 I cover the stacked diapers in layers for padding, then stretch the blanket over these and tape it to the bottom of the foam core. I buy 2" wide ribbon to tie the wheels onto the car base. You can see the Safari jeep here. Above is how I started the new jeep this morning. I will have a separate post later giving more details. I ended up taking diapers out of the middle(leaving only 3 per stack) and adding those to the front and back stacks to make the seats of the jeep. I wrapped the entire board and diaper stacks in the blanket above, taping it to the bottom of the board. The new baby is going to be a girl. Her name is going to be (tentatively) Olivia. Since I had already thrown an Olivia the Pig baby shower for the baby's cousin, we were stumped for a theme. Then I found out the new father-to-be had begun buying owl themed baby items for the nursery, AND he was referring to the baby as OWL-ivia, we decided on the forest babies, or woodland, theme. I found a cute book entitled "Bear's New Friend" ( who turns out to be an OWL) and the planning began. 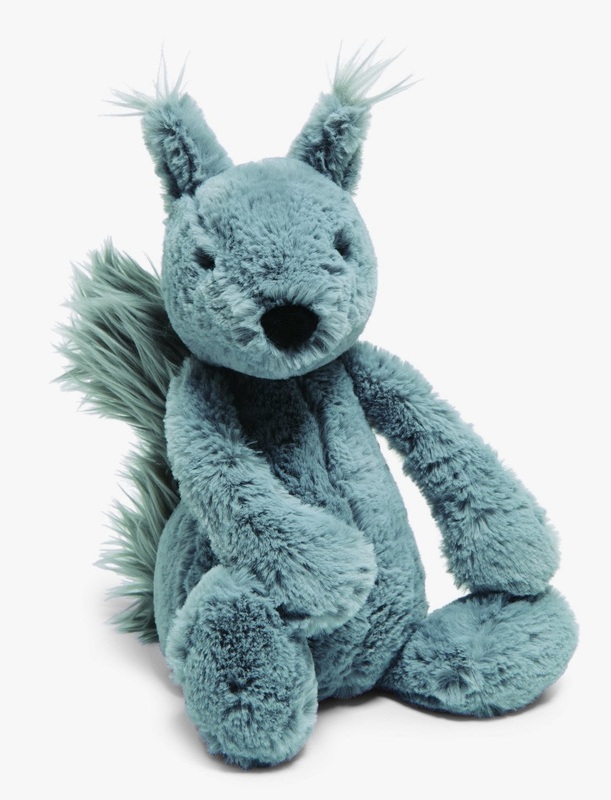 Of course, I HAD to order the Jelly Cat squirrel because he was just so cute. Here is a sneak peak at the working model of the jeep. Each tire used 13 diapers. The bear and owl are so floppy that I had to put his hands on top of the windshield. The small yellow disk in his lap is a battery operated steering wheel. You can see the gray ears of the squirrel sitting on the back of the jeep. Above are 20 cake pop bibs I made for you to take. Print them out on 8.5" x 11" cardstock. Punch a hole in the top of each one after cutting them out. Slide onto cake pop stick. I made baby faces for the Safari baby shower last fall and put bibs under each cake pop head. Or... enlarge them as labels for waters or favors. I bought the images, so they are yours to use, but you can not sell them or use them for commercial purposes. 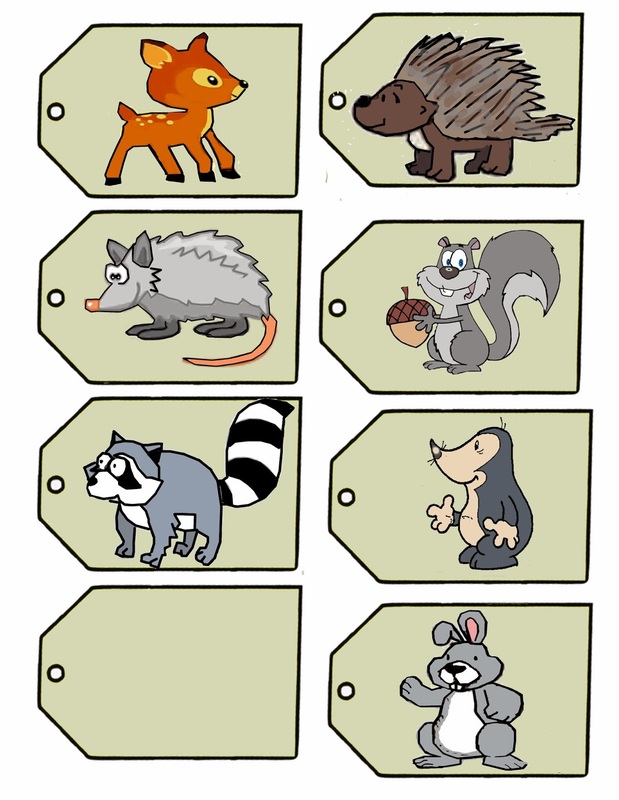 I decided to put my animals on drink tags for my empty Starbucks punch bottles. I got plain twine to tie them onto the neck of the bottles. 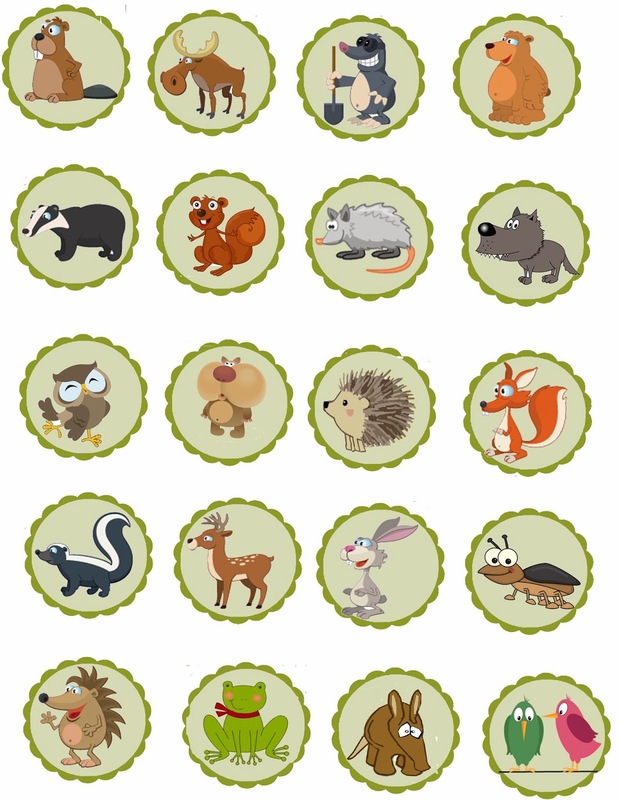 I included this set for you to see as I outlined and cleaned up a few more animals than those I put on the cake pop bibs. 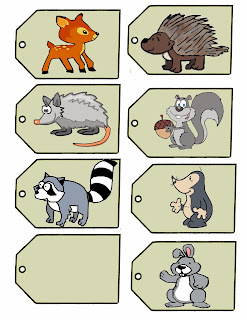 I also made pendants with these animals enlarged on them. I will string them with ribbon for across the fireplace. I sent over to BFF's house all the table setting things along with some folding chairs. Included was a tiny surprise. 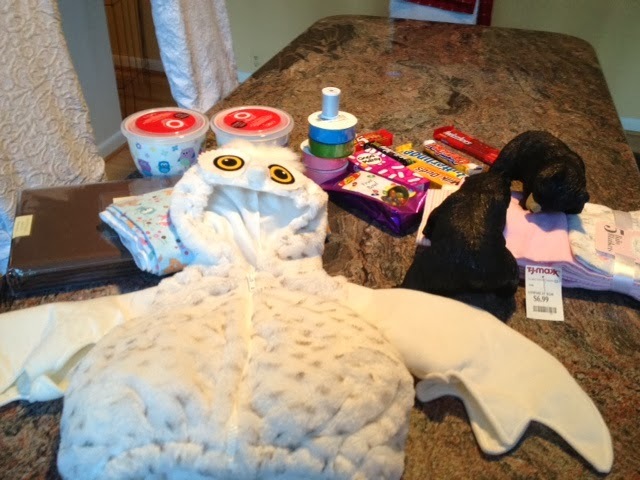 I sent along the nests I had used at Easter. I am making cake pop owls to sit in each nest. (Photo to come later). They will be wrapped in cellophane, so that the guests can take them home as favors. I bought the dessert stand here. My other two best friends got me out of the house (and stress due to hubby's cancer) and we went to Costco. They encouraged me to BUY desserts instead of baking the cheesecakes. So...I got a great carrot cake, a chocolate mousse cake, and a box of nibble size desserts, like tiny eclairs. 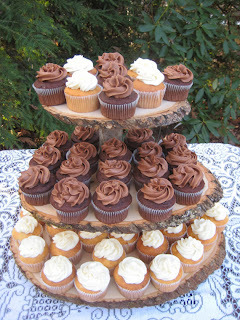 This way I can now concentrate on the cake pops and s'more cookies. The mother bear and her three babies from my front porch are also going to the party. We have decided to cater the lunch, so the main meal is covered. I will update this post in a few weeks with photos from the party. I have a Fun Things for Kids Pinterest board. I pinned the directions from a mom who made her own FELT campfire. I am listed as FunJani on Pinterest. I LOVE THIS RUNNER!!! I went on to the site you mentioned to purchase it, but they don't seem to have it anymore. 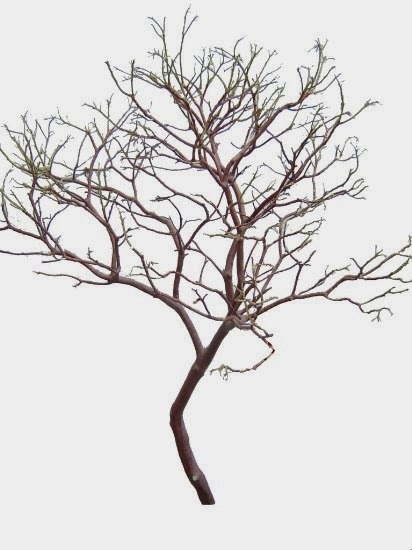 Do you happen to know what it was called? Have you seen them anywhere else? I'm hosting a modern woodland theme shower soon, and these would be perfect. I called the company. It was so popular that the company sold out. They told me it would be back next spring. If you live in Northern Virginia, though, you may borrow it.